It takes a little finesse to garden with very young children and a lot of patience, but there is so much for children to learn in the garden. The sensory experiences alone are immeasurable! 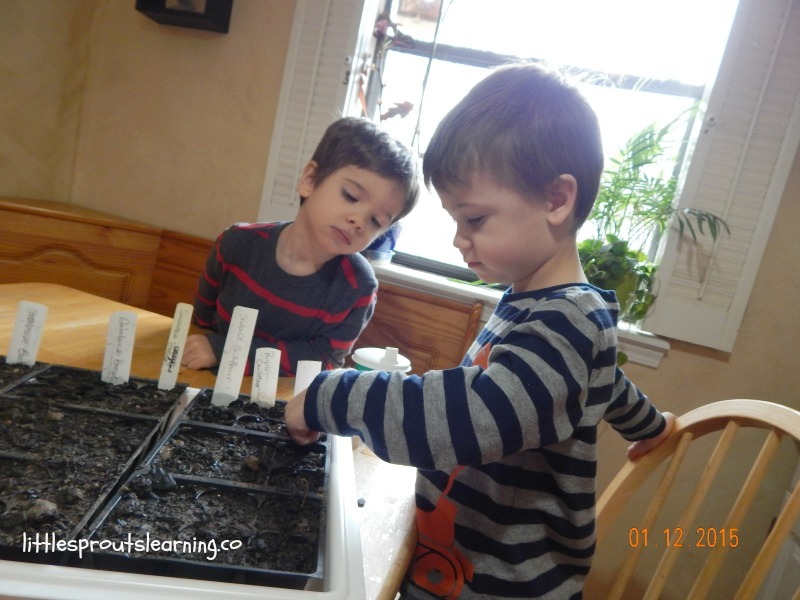 Most kids love being in the garden while they are learning skills that last them a lifetime. A child learns 80% of what they will learn in their entire lifetime by the age of 4. That’s a lot of learning from birth to 4! It’s an important time we must capitalize on. The garden teaches math, science, reading, social studies, and so much more. 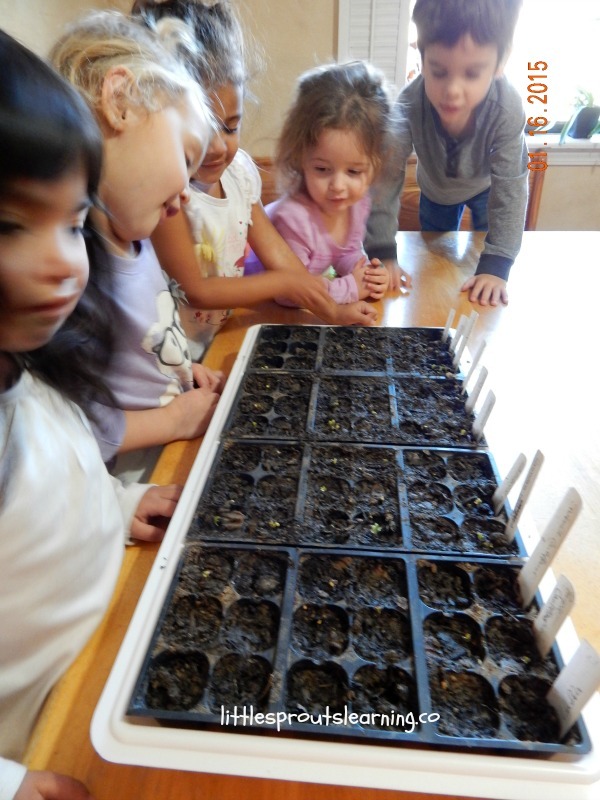 In addition, children learn to try new foods by growing them. 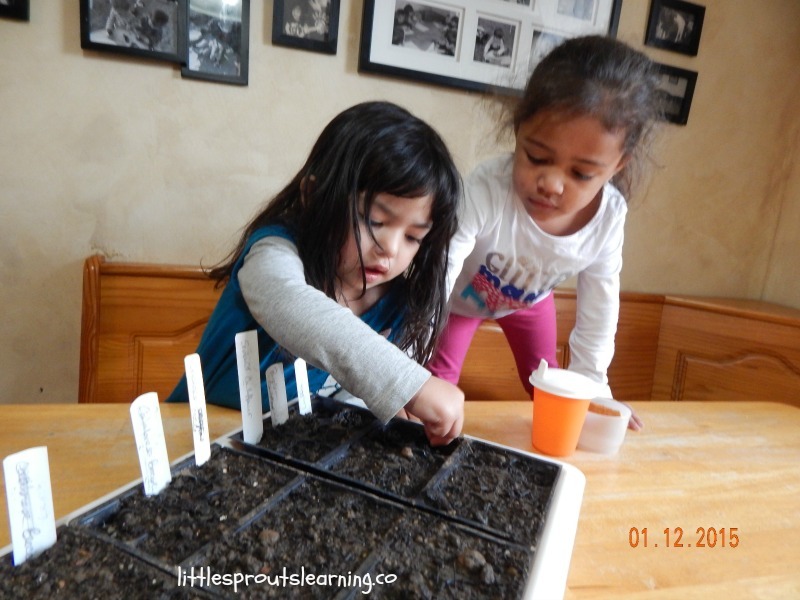 Click here to see why I garden with my kids. Besides the fresh air and exercise the garden provides, children get the health benefits of eating fresh, healthy, chemical free foods that are at the peak of flavor. Mmmmm, a garden fresh tomato, not much can compare to that. To see some other great benefits of gardening, click here. My kids are ages 1-6, and they can plant a seed and harvest a perfectly ripe fruit or vegetable with very little or no guidance from me. All it took was a little repetition and a little more patience to teach them the proper way to do it. Now they are pros. Don’t forget when you’re gardening with little ones or even if you’re just new to gardening yourself, start small, it’s easy to take on too much and get overwhelmed. At Little Sprouts, we are getting ready for our spring garden. We are planning to grow a very large variety of fruits and vegetables that we enjoy and we are going to grow as many of our own seedlings as possible to save money. Seeds are very inexpensive, but seedlings can sometimes be costly. To see what we grew last year, click here. 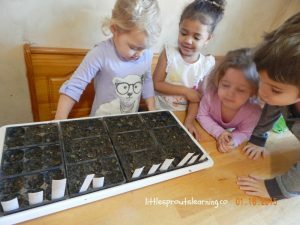 What do you need to grow your own seedlings inside for the garden? Seeds for something you want to eat. We grow mostly heirloom seeds also called open pollinated. The reason is so we can save our own seeds to grow the next year. Potting mix and a container to hold it. A proper light source such as a grow light or a shop light with enough light to keep your seedlings growing strong. 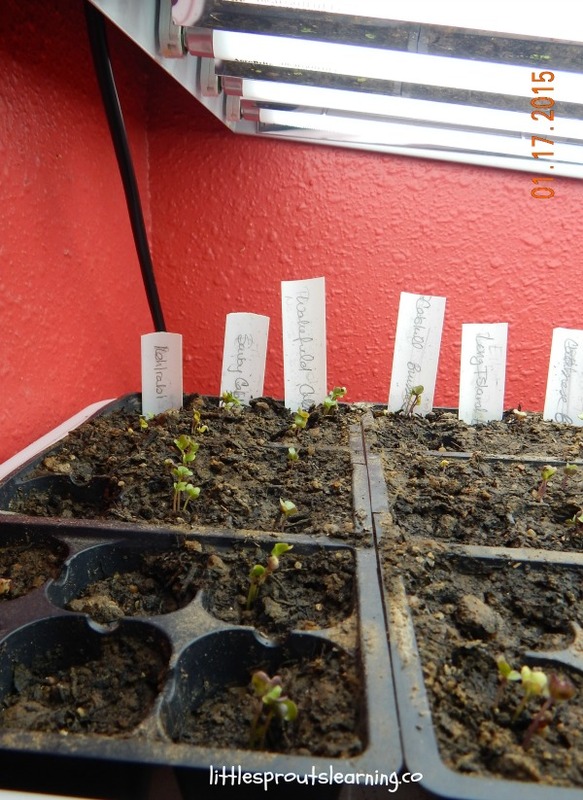 Most seedlings need more than just a sunny windowsill to grow strong enough to plant outside. A fan or source of air to circulate and provide enough gentle breeze to help the seedlings grow strong stems and roots. Water to keep them hydrated. When you are ready to plant seeds with your kids, you need to get all your supplies ready ahead of time to keep the kid’s interest. Show them your excitement as you get ready to plant. I write out the markers ahead of time so they can just make the holes and drop in the seeds and don’t have to wait for me in between types of plants. I show the kids how deep to make their holes by their knuckles. Tiny broccoli seeds for instance, go one knuckle deep, bigger seeds go two or three depending on the kind. Then I tell them to cover the seeds gently and press down the soil no harder than they would rub their eye. The kids do this without my intervention, only those few words. At first, it took more than one try to get the seeds placed correctly, but now that we’ve done it a few times, they can do it without my help. Once they have planted the seeds, you can let them mist the seeds with a spray bottle. They love this exercise and it’s great for building fine motor skills for writing. If you let the kids use a watering can or other form of water, they may wash away the seeds since it’s hard to control how much water comes out of the can. If the seeds need more water, you can always pour some into the bottom of your tray before you put it under the light. 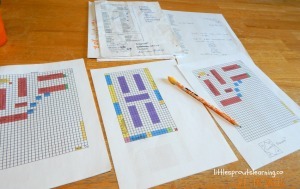 This week we worked on our spreadsheet to plan out where we will plant what in the spring. It’s important to plant your plants in a different area than you did the year before for pest control and soil health. So we took the spreadsheet from last year’s crops and chose new places to plant each thing and penciled in the names. We are super excited about growing stuff again this year. We can’t wait. Our list of things to grow this year includes: broccoli, cauliflower, cabbage, kohlrabi, carrots, peas, onions, potatoes, radishes, lettuce, kale, spinach, swiss chard, Brussels sprouts, summer squash, winter squash, pumpkins, corn tomatoes, peppers, tomatillos, asparagus, nastursiums, lavender, sunflowers, herbs, beans, cucumbers, artichokes, garlic, sweet potatoes, okra, watermelon, cantaloupe, and luffa gourds. And for an experiment that we have never grown before, peanuts. For planting times for each plant, check your local county extension website. If you live in zone 7, like we do, you can click here to see our planting time chart. My kids and I planted seeds Monday for broccoli, cauliflower, cabbage, kohlrabi, Brussels sprouts and luffa gourds. 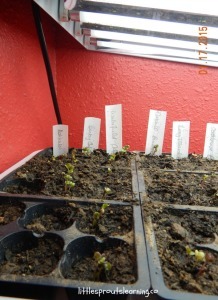 In just a few days, the seeds sprouted and excitement filled the air. Whether its the first time or the one hundredth, it’s always amazing to see the seed emerge from the soil and unfold it’s tiny leaves. And 5 days later, here are our baby plants. Pretty adorable if you ask me. It’s so worth the time and effort to grow your own food and teach that skill to the next generation. I hope you plant something with your kids today!